La Alcazaba, built in the tenth century by Caliph Abd- al-Rhaman III dominates the skyline, and can be seen from any part of the city. 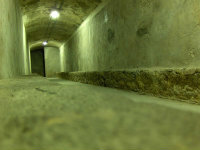 This formidable military fortification has three huge walled enclosures.The first compound is the largest of the three and was originally designed as a military camp and a place for refuge for the public when the city came under siege.A well in the centre could draw water from a depth of 70 metres. 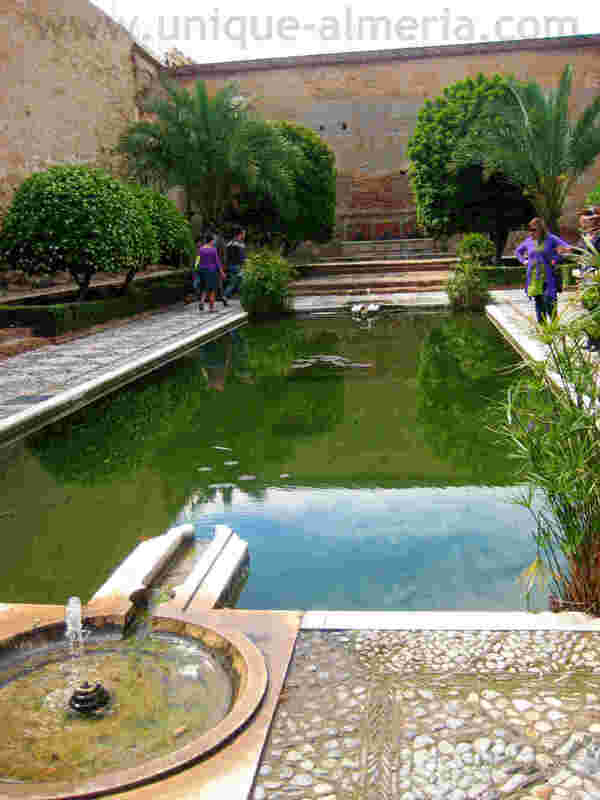 Today the area has been transformed into a lush garden.The second compound was once the heart of the structure and housed Moorish kings, when resident in the city. It contained public baths, a mosque, homes and a palace. The third and highest compound was adapted after the reconquista by the Catholic monarchs. It’s built on a triangular ground plan and is guarded by three semi-circular towers, including the impressive Tower of Homage. La Alcazaba is easily reached by climbing any of the narrow streets west of the cathedral, and from the top of its walls your eyes will widen at the stunning views of the city and port. It has a perimeter of 1450 meters with walls 5 meters high and 3 meters thick dominating the entire city and harbor. 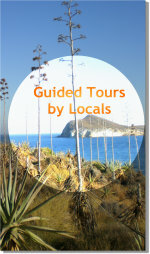 You will get the best views from two of its towers and from the troglodytes homes in the nearby neighborhood of "La Chanca". Its 1000 years of history are attached to the city, accompanying periods of splendor and decadence , as a privileged witness from that promontory as a watchtower overlooking the Bay of Almería . 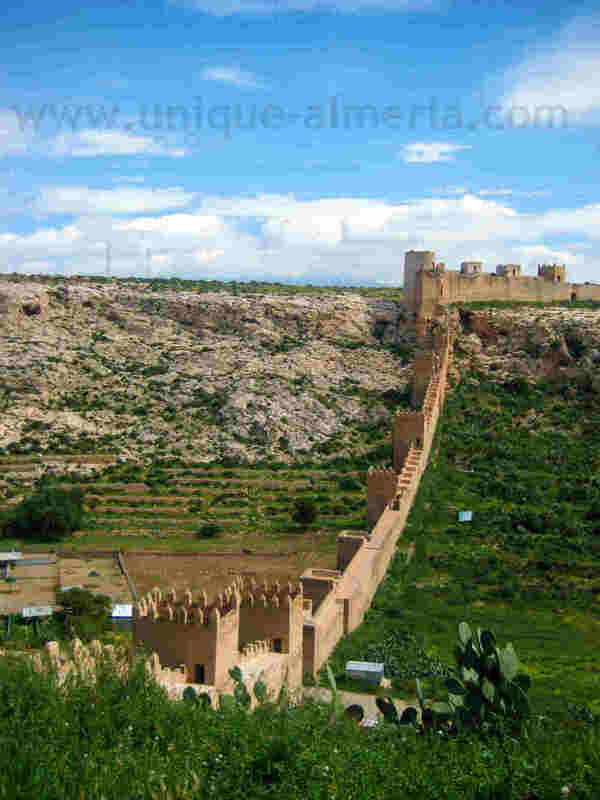 In 955 , Abd al- Rahman III, the first Caliph of Al- Andalus , granted the category of "medina" to the heart of Almería , instructing to build the Citadel , the Great Mosque and fortifying urban space , between the citadel itself and the sea shore. 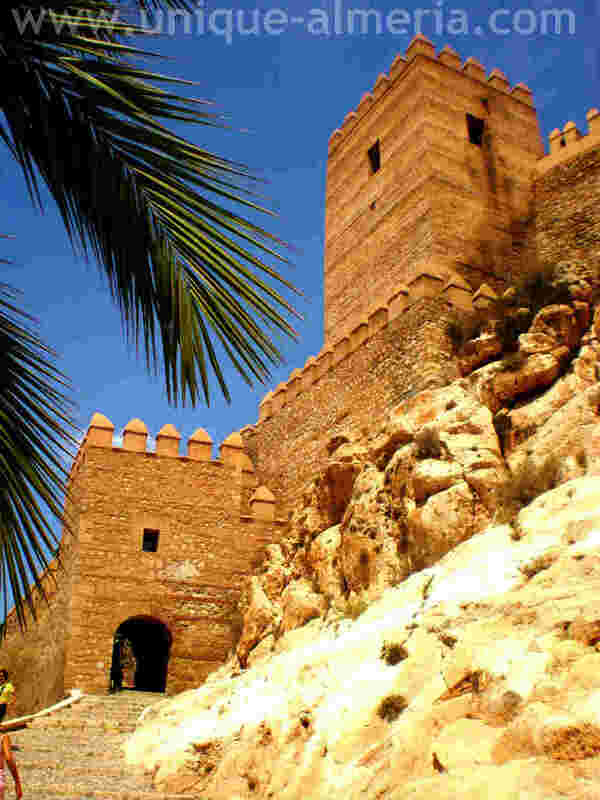 The Alcazaba was built on the ruins of an earlier fort, probably dating back to 840, used as a defense from Norman attacks, on an isolated hill overlooking the bay. Under its protection, Almería City became the major Al- Andalus maritime outlet and headquarters of the Umayyad and its admiral fleet. In its shipyards large warships were manufactured. It is a beautiful and large fortress, in fact it is the largest of all defensive structures built by the Arabs in the peninsula Iberia (and the second of all Muslim buildings after the Alhambra Palace). It was declared a National Monument in 1931. Muslim texts recognize Almería as the best market in Muslim Spain . Not only came to its port Muslim merchants from Egypt and Syria but also Christians from France and Italy . Merchants and travelers abounded in the streets, and taxes collected, far outweighed those of any other seaport. The fortress was reformed in the eleventh century (in 1014, 1038 and 1040 ), in the twelfth century (1157) , and in the fifteenth and sixteenth centuries. 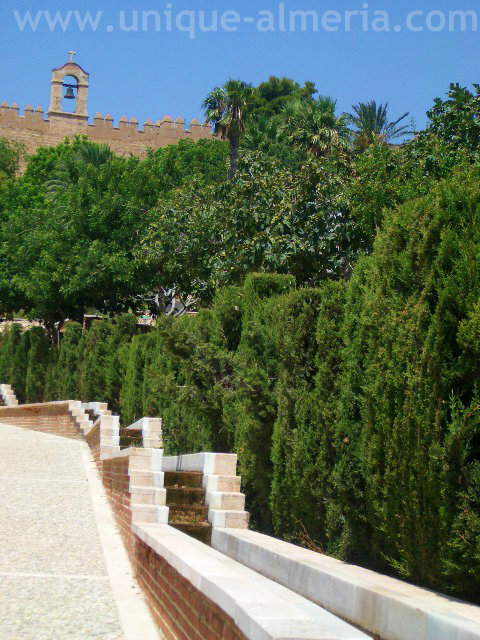 Today, the Alcazaba consists of two Islamic enclosures and a Christian castle. You enter the fortress through an Albarran tower and from there wall up a zigzagging ramp guarded by the Torre de los Espejos to the Torre de la Justicia, which has a strategically placed bend before you reach the entrance. The first enclosure, like the second, is of Islamic origin. Today it is landscaped thanks to the work carried out to prepare it for visitors. However, in Islamic times, there was an entire structure of streets and houses, the remains of which were discovered in the arechaelogoical excavations carried out during the 1980s and 90s. There was also a complex water supply network of wells with waterwheels, cisterns and channels, the remains of which are still preserved. If you follow the first option, the first important archaeological element you encounter is a hydraulic complex consisting of a cistern, a fountain and a well. The second choice of the route takes you through small terraces and fruit trees, with the above mentioned complex to the left. The third itinerary ascends parallel to the northern stretch of the wall, the only complete section of the original wall preserved today. All three itineraries come out in front of the Muro de la Campana de la Vela, a section of wall that separates the first and second enclosures. You enter the second enclosure from one of the two towers on either side of the Vela All. If you go through the North Tower, you will pass by the shop. The upper rooms of the two towers house interpretation areas where you can learn more about the Alcazaba and the town of Almeria in Islamic times. Northward the Alcazaba, you will see a line of wall, leading to the hill "Cerro de San Cristobal", built during Kingdom of Jairán (1012-1028) in the eleventh century . 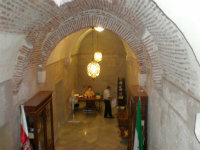 It is a left over that surrounded the once Muslim neighborhood and descended from the hill to the street Antonio Vico. On this hill, in Muslim times known as Laham hill, there are seven towers. Three square ones, from Muslim times, and four semicircular ones built by built by Christian Templars, after the Christian conquest of the city ​​under the commanding troops of Alfonso VII in 1147. 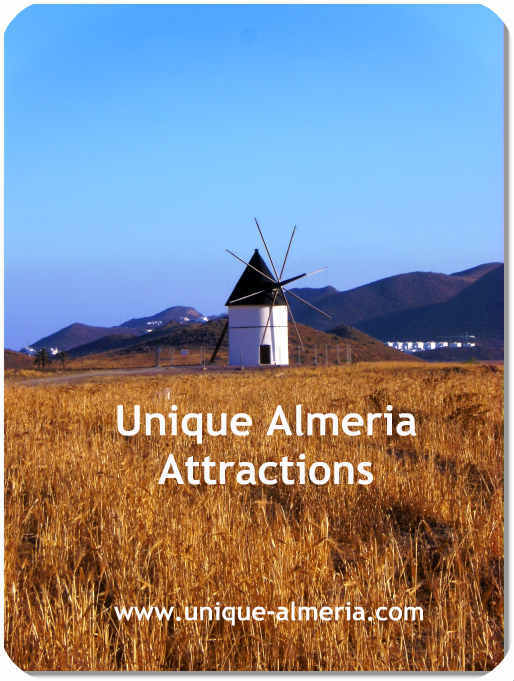 Here, one will enjoy an impressive view over Almeria city. There is also a large pedestal, made of marble from the nearby village Macael, representing the image of the Sacred Heart of Jesus, blessing the city and the Mediterranean Sea. It was built in the twentieth century (around 1930) and restored in 2000.
directed by John Milius, starring Arnold Schwarzenegger. While most scenes of this movie where shot in the neighborhood Almerimar, it is here on the "Cerro de San Cristobal" next to the Alcazaba, where Arnold Schwarzenegger wielded a sword in the play 'Conan the Barbarian'. Apart from using the Desert of Tabernas and Monsúl Beach as a set, the filming crew also moved to the capital, where the nearby street "calle Almanzor" and the plaza at the entrance of the Alcazaba was almost completely converted into a Hollywood stage. For this purpose, Steven Spielberg requested that the lamps and wiring in the streets were removed, while the city's School of Arts became the palace of the Sultan. 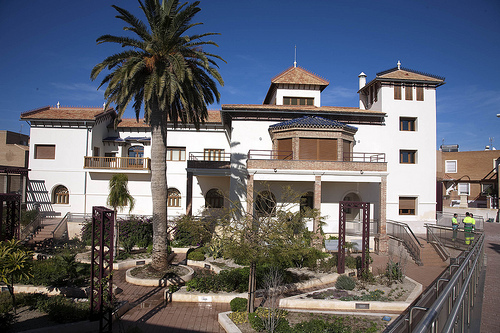 The Alcazaba served as the set for the most important footage of this movie, along with the neighborhood "Pechina". As the Spanish Director mentioned to the local press: "The reasons that led me to choose to shoot in Almería is that I always regarded it as a copy of Jerusalem, and when I got the script it was clear to me that I had to shoot in Almeria."